The genius world records proclaimed the biggest gummy bear 81-pound, 3-ounce gummy bear that stood two feet tall and two feet wide. A Sunday school class teamed up with a restaurant in San Antonio, Texas in 2011 to create the sugary behemoth. Other notable gargantuan gummies include a three-pound, two-foot, 4,000-calorie gummy worm sold online. *Wash your strawberries, slice the greens off and puree in a blender. Measure 2 cups of the puree and place in a medium-sized bowl. Stir in the lemon juice, stevia and food coloring. It helps to have another person help you here. Have one person spread open a nut milk bag over a large bowl while you pour the strawberry mixture inside. Tie the bag closed and squeeze the bag to get as much liquid out as you can. You should get 1+3/4 cup (or 334g) of the mixture after straining. Pour the mixture into a nonstick saucepan, sprinkle the gelatin overtop and let it sit for 5 minutes. 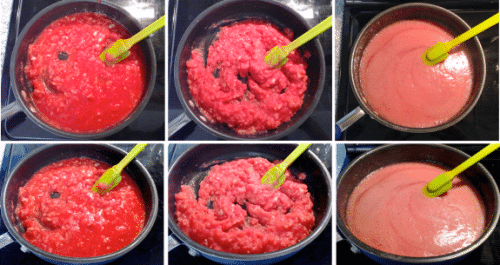 Stir it together and smush any big clumps of gelatin, don’t worry about the small ones, they’ll dissolve. Place the pan over medium-high heat and stir occasionally, until it comes to a light boil. Stir constantly when the mixture boils harder. When you can’t stir the bubbles away, keep it on the heat for ~30 seconds and then remove from the heat. Let the mixture sit for a few minutes so the foam/bubbles have a chance to go away, then carefully scoop the mixture into gummy bear molds. Let the molds cool on the counter for about an hour, then place them in the fridge. Refrigerate until firm. 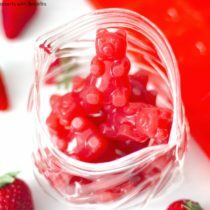 To store, place gummy bears in an airtight container and refrigerate. Haribo gummy bears are named after their founder, Hans Rigiel Bonn. THE GREEN ONES ARE STRAWBERRY FLAVORED (Unless they’re Trolli brand, then they’re lime), I always thought it was strange that they never tasted like lime. Adventures of the Gummi Bears was Disney’s first major serialized, animated TV series.